Gorgeous giclee art print from the Star Wars universe! From Star Wars: Episode V - The Empire Strikes Back, when the gang heads to Cloud City on Bespin. Paper giclee is signed and a limited edition of 125 pieces! You may think that you can simply glide into Cloud City unannounced and unnoticed, but sorry, no, it's not like that anymore. Since Lando Calrissian became Baron Administrator of Cloud City, he's gone and developed both a tourism and casino industry on the famous floating city. Due to this fact, stricter regulations had to be placed on incoming starships as a way to streamline all of the traffic from both tourist vessels and commercial ones. 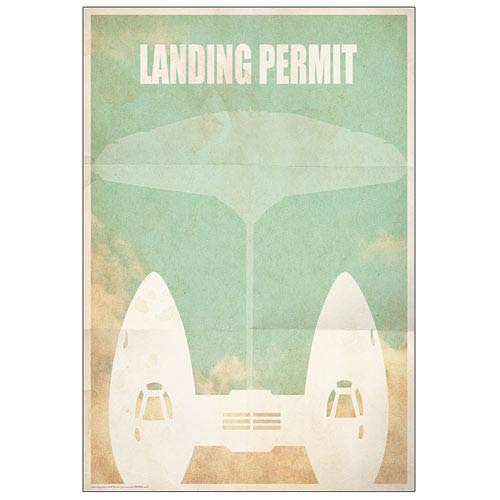 This Star Wars Cloud City Landing Permit Paper Giclee Print features an image of a Twin-Pod Cloud Car, the staple vehicle used by Bespin Security Forces, along with the words, "Landing Permit," with Cloud City in the background. A limited edition of 125 pieces, this fantastic giclee piece of artwork has been printed on paper, signed by artist Jason Christman, and measures 19-inches tall x 13-inches wide. Ages 15 and up.